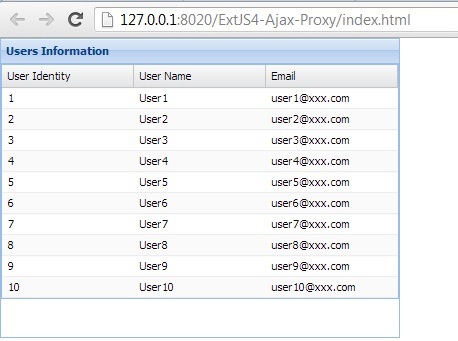 Ajax proxy in Ext JS is most widely used one for reading and writing information from/to web server. The configuration of ajax proxy is applied either in store or model class and it is based on the following criteria. 1. We need to define our proxy configuration in model class whenever we need to reuse the same model in various stores with same proxy configuration. 2. We need to define our proxy configuration in store class whenever we need to reuse the same model class in various stores with various proxy configuration. Let's see an example for Ajax proxy. Here I am getting JSON data from web server and displaying those data by using grid component. Here, the important thing is proxy configuration. 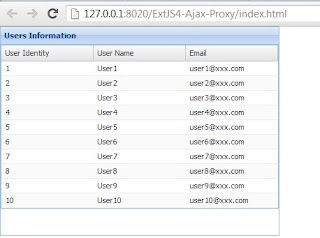 I have set the proxy type as 'ajax' and specified the server URL for loading and updating data. We can use different URL for performing read and update operation. The reader is another configuration is used for decoding server response and it updates the store based on the decoded information. Here I have used JSON reader, apart form JSON reader Ext JS provide some more readers like Array and XML. The reader is very handy if you are loading nested data from server. For performing read operation, ajax proxy send a GET request and for performing create, delete and update operations it send a POST request to server. We can't use ajax for reading information from other domains because it's violating DOM security principles . For talking to other domains, we need to use JSONP proxy. In real application, we have to send some extra parameters to server. In this situation we need to use ajax proxy extraParams configuration. Check the Ext JS sencha documentation for getting more information about AJAX proxy. Here, I have used the grid component for displaying store data. In controller init function, I have taken the User store handle and called the load function. In this situation, the ajax request is send to server for loading data. The application source code is available in github repository.